Who is B. Thaddeus Balls? 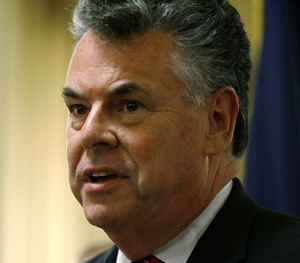 At some point, you would think that Republican Congressman Peter King would have thought about the consequences. This is not a stupid man we are talking about here; he is well educated and seasoned in the ways of Washington and the press. He is a rather typical Republican Congressperson; excepting his votes against the articles of impeachment for President Clinton, his record is GOP down the line. King voted for the bailouts of the banking and auto industries, and against the stimulus, which was designed to bailout regular folks by cutting taxes, extending unemployment benefits, and creating or saving working class jobs. He is is pro-life (NRLC), anti-civil rights (ACLU), pro-big business (USCOC), anti-public education (NEA), anti-energy independence (CAF), anti-environment (LCV), and anti-labor (AFL-CIO). He diverges from the GOP on trade issues, and seems to be an old school isolationist. The GOP strategy of opposing the President is nothing unusual or surprising. In the world of politics, it is not even noteworthy. The notion of not having to lay out a complete agenda, however, is nothing less than a stunning departure from the concept of democracy. People make cynical jokes about elections being popularity contests, but we the people are supposed to be voting on something. Laying out a complete agenda is the unwritten law of the land; laying out the complete agenda is the process of revealing your platform. It is a poor enough reflection on the GOP caucus that they have opposed everything without offering counter-proposals; to do so in an election cycle is beyond the pale. Refusing to reveal your agenda is Un-American. Refusing to reveal your agenda is cowardice…pure, unadulterated, yellow-bellied, cowardice. Offering the aside that you won’t reveal your agenda because the mainstream media will try to make campaign points out of every issue, only serves to turn the maker of the remarks from a coward into a coward with a lame excuse. All media are supposed to make campaign issues out of every candidate’s platform. That is called political reporting, and it is the cornerstone of an informed democracy. Given what we know of Peter King in the public record, he is no coward. He has gone against the GOP whip a time or two, and to do so requires intestinal fortitude. Republicans are nothing if not the party of party discipline. Peter King is no fool either; so how does this happen? What makes an intelligent man of courage take a position that is so recklessly departed from the American ideal? It is my contention that he made this remark because it is indeed the Republican plan for the mid-terms. Republicans don’t want the voting public to know their agenda, because that public wouldn’t vote for them if the agenda were revealed. It is that simple. Republicans fought health reform with slurs and outright lies, to include the damning idea that the Democrats plan involved granny-killing health care rationing. In fact, the GOP agenda as revealed by Rep. Paul Ryan in his budget proposal, is built around health care rationing. The CBO, which gave a preliminary score to the measure (which does indeed control the deficit), confirmed the actual rationing of senior health care benefits that are the key to the plan. The plan is simple for the GOP; privatize Medicare and Medicaid, and give vouchers to the recipients to buy insurance on the private market. Then, index the growth of those vouchers to overall inflation, which has averaged less than 1/4 the rate of health care inflation over the past decade. Granny will simply have to make do with less and less health care every year. Republicans aren’t stupid…in general. They watched senior citizens last August scream about Socialism and warn their Democratic representatives that ‘the government better not touch my Medicare’. The GOP let the genie out of the bottle to attack Democrats over the past 18 months, and now they are trying to avoid being caught up in the magic themselves. The Grand Old Party has played a dangerous game, and people like Peter King and John Boehner are starting to run out of chips. You can only attack the President so many times for things that the previous presidents did worse and more. You can only change your argument so many times before people with You Tube and memories call you on the carpet. The Republican Party has been running out of the “voter is stupid” playbook for some time now, and someone forgot to tell them that it is outdated. The voting public is now wise and well equipped, and the Republicans are quickly climbing a mountain of stupidity. It will certainly be cold and lonely at the top. Episode 7: Why We Must Elect Rick! Episode 8: Don't Make Me Use the "S" Word! Episode 10: Settle for Mitt! Episode 12: Austerity and Obama's Debt! Episode 13: From My Cold, Dead Hands! Episode 14: Ryan is a Bold Choice for VP! Episode 16: Mitt & Me; 2 Peas in a Pod! Episode 19: The Boss is Running! Animated Balls: A New Frontier! Piers Morgan & the White House Conspire Against Alex Jones! PIERS MORGAN AND THE WHITE HOUSE CONSPIRE AGAINST ALEX JONES!!! E2012: The Boss is Running!